A campus estimates the cost is $7,000 per week. This equates to $364,00 annually. When the button is pressed, the door opens at a slower pace than would if a person had just opened it themself. Typically, with the button the door will stay open for an average of 20 seconds, letting air in and out- wasting energy from the building’s heat or air conditioning. Northern Kentucky University attempted to monetize this loss. According to The Northerner, an engineering firm located near the campus, estimated that it cost 2 cents every time one of these buttons was pushed. While this may seem like a piddling amount (and a good way to get rid of pennies), it adds up, with the newspaper reporting that irresponsible use of automatic door open buttons could cost NKU more than $7,000 per week. This equates to $364,000. Doesn’t seem like such a minor thing anymore, does it? If we just open these doors ourselves, it will not have a big impact on our personal energy. On the other hand, it will have a substantial impact on the overall energy wasted for the building that has the automatic door open button. If we keep this in minds as we go about our day, we can save energy around us and respect those who need these utilities to go through their own day. We have all seen it before - the automatic door open button on a building door. 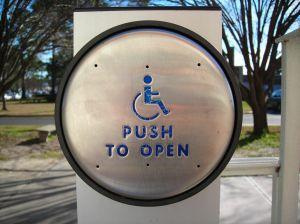 It makes the day easier or simply possible for those who need it, specifically, elders or individuals with a disability. However, these folks are not the only ones who are using this button regularly. In fact, according to a study at Stanford’s Psychology Department, nearly 75 percent of people who press this button are not physically disabled. We can do better. Here at UMBC, you are more likely to see polite people holding the door for you than you are to see young and able-bodied people using the handicap door button. Why press it, wait for the doors to slowly open and then walk in or out. It's so much quicker and more efficient for to simply push the door open and walk away. I will admit, I have been guilty of doing this multiples times in my life. But it is a habit that should be broken for those of us who do not need the assistance. Unnecessarily pressing this button has its own negative impacts, perhaps put most simply, it wastes energy. Like any other electric machinery (elevators, etc), the more times the button is pressed and the door automatically opens, the easier the button can malfunction or break. This means it will need to be repaired more often and is less available to individuals who require this assistance in their daily lives. And this is not the only kind of energy wasted. There is most likely heat or air conditioning running throughout the public building that is escaping. At UMBC almost half (45%) of the energy used is for heating & cooling. With our commitment to lowering our carbon emissions and addressing climate change, it's one more mindful decision you can make to save energy.